Queso fundido is a Mexican appetizer that literally translates to “flamed cheese”. 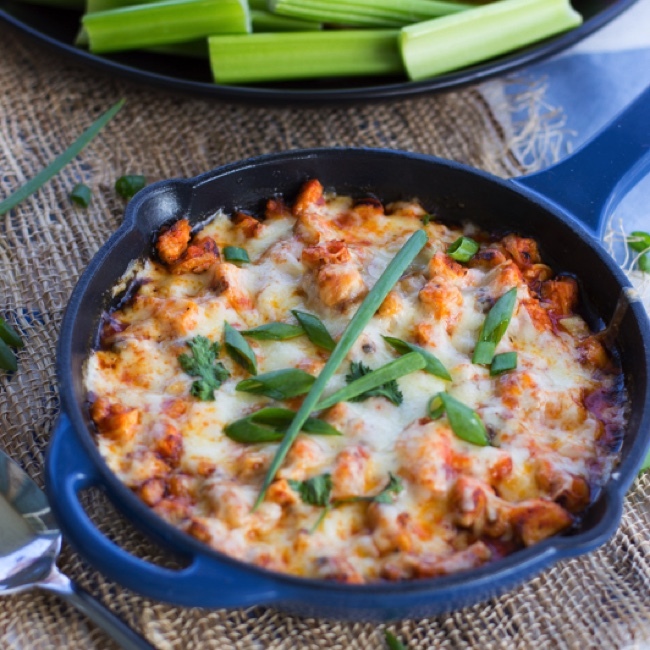 This spicy buffalo chicken fundido is the perfect combination of cheesy and buffalo! Not only is this fundido delicious, but it’s versatile in how you serve it – try it as a dip, or as tacos for a main dish! Happy Tuesday, friends! 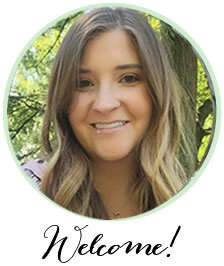 Today’s post is super exciting… because who doesn’t love anything buffalo-flavored? And who doesn’t love Frank’s RedHot?! Seriously, I Put That $#!+ On Everything! 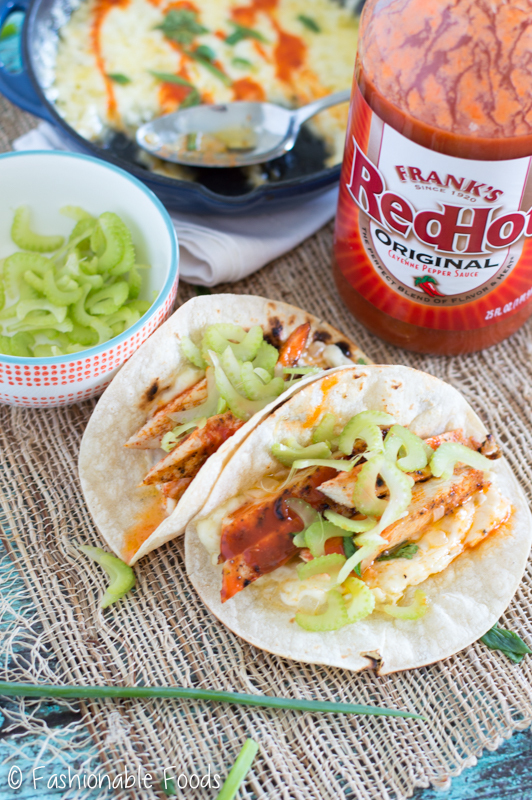 Frank’s RedHot Buffalo is perfect for Summer. 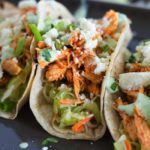 Before we jump into today’s recipe, check out their Buffalo Chicken Sandwich recipe below and visit their site for inspiration! 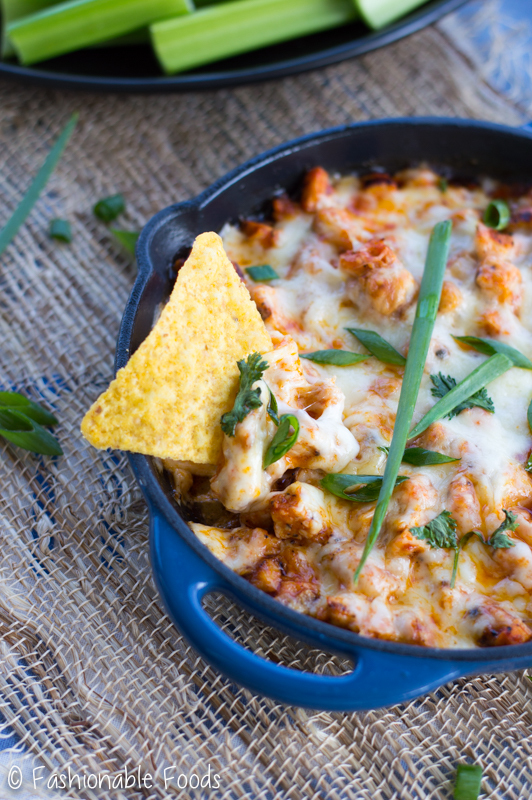 Alrighty, let’s talk about Buffalo Chicken Fundido! Have you ever had Queso Fundido? Ever heard of it? Queso Fundido translates to “flamed cheese” and is a classic Mexican appetizer. It’s commonly made with chorizo and served as a dip or smeared into tortillas. 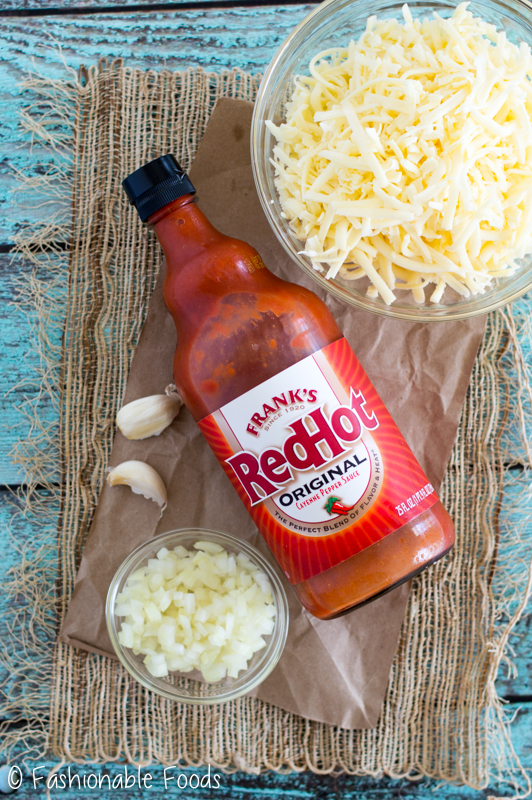 Frank’s RedHot Original is the most versatile sauce that can be used for a wide variety of dish types. So of course I had to create a Queso Fundido that uses it! And let me tell you, it’s amazing. 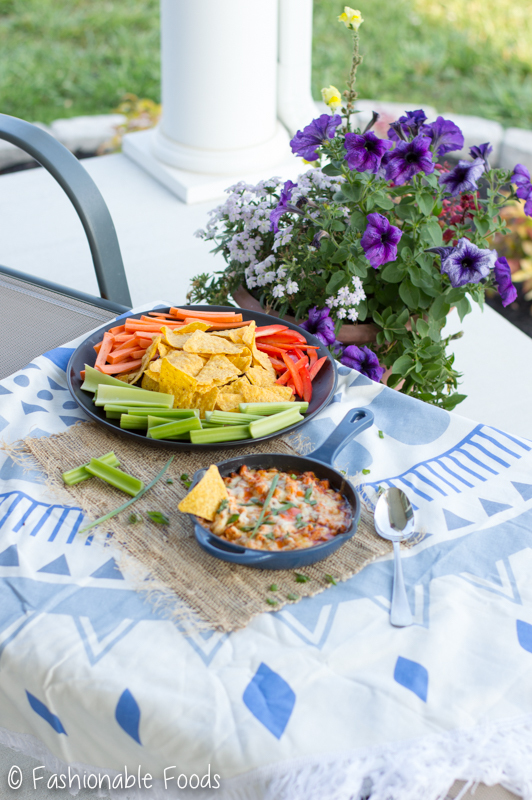 Not only is this delicious fundido addicting, but it’s the perfect summer recipe! I love entertaining outside once the weather allows for it. Can you believe we are only 2 weeks from the 4th of July?! If you’re like me, you’re probably already planning your menu. I highly recommend you include this buffalo chicken fundido. HIGHLY RECOMMEND. (No, I’m not yelling at you, I’m just really excited about this recipe.) ? How do we make it, you ask? Very simply! You’ll start by seasoning some chicken cutlets – you guys know how much I love using chicken cutlets. They are quick-cooking and are so tender! However, you can also just use 2 chicken breasts if you don’t want to do cutlets. You’ll have to increase the cooking time, though! Ok, so we season the chicken with the spice mixture, grill ’em up, cut them into small cubes, and toss with sautéed onions, garlic, and Frank’s RedHot. Layer that mixture with cheese, pop it into the oven until melted and bubbly, and boom! You’re ready to be in cheesy buffalo chicken heaven. Be sure to top it off with more Frank’s RedHot and some fresh cilantro and scallions. 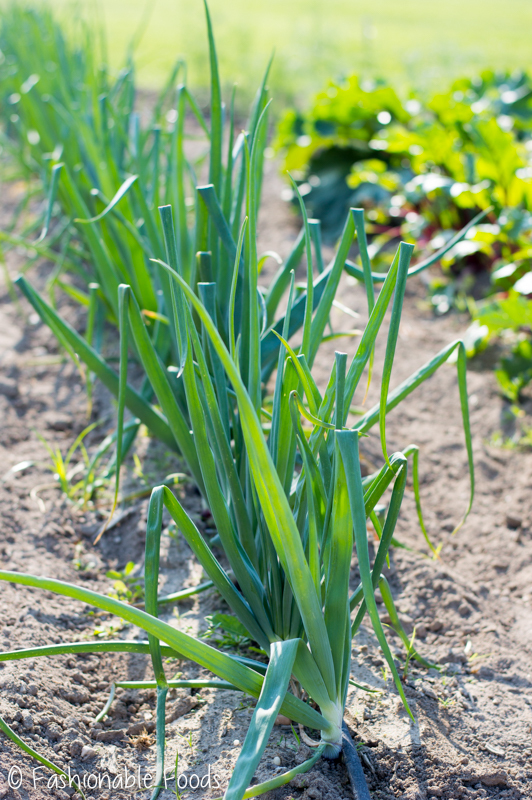 I grabbed my scallions from my garden, of course. ? My favorite thing about this recipe is how versatile it is. You can serve it as an appetizer alongside some tortilla chips and veggies for dipping. Or, you can serve it as a main dish in taco form. We all know how much I love tacos! For serving as tacos, you have two options. First option is to make the recipe as written, and then just smear the cheesy dip into warm corn tortillas. Top ’em off with sliced celery and more Frank’s RedHot. YUM! 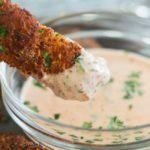 Another option is to make the dip, but keep the chicken separate. After you grill the chicken, slice it and toss with the Frank’s RedHot. Then smear your warm tortilla with the fundido, top with a few pieces of chicken, some sliced celery, and you guessed it… more Frank’s RedHot! 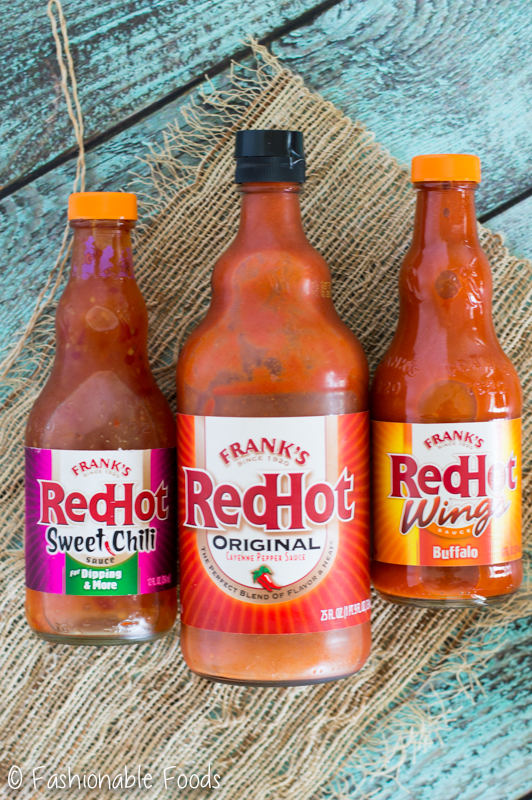 Frank’s RedHot Sauce is the most [email protected] hot sauce out there – it’s the perfect combination of flavor and heat! 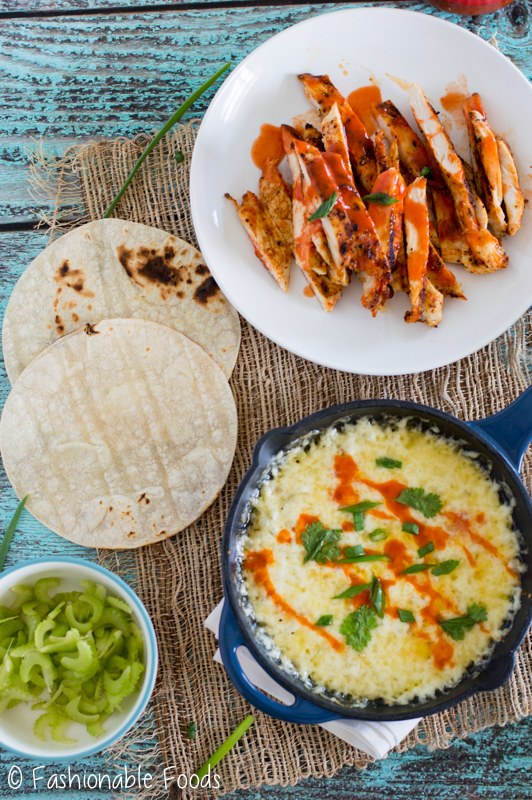 I guarantee you’ll love this spicy buffalo chicken fundido, and so will your guests. ? 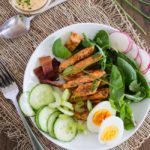 I also recommend checking out all of Frank’s RedHot sauce varieties – the original is what I used in this recipe. But, there’s also Buffalo Wing Sauce and Sweet Chili Sauce. For years Kyle has been using the original Frank’s RedHot on his eggs every morning, but recently he’s been using and enjoying the Sweet Chili Sauce! We Both Put That $#!+ On Everything! Preheat your outdoor grill to 450º. If you don’t have an outdoor grill, you can use a grill pan or just a sauté pan! Combine the spices in a small bowl and sprinkle them evenly over the chicken cutlets. Drizzle the chicken with oil to coat. Grill the cutlets for 2-3 minutes per side or until cooked through (the thinner they are, the faster they will cook). Transfer to a plate and let rest. Meanwhile, heat a 10-inch cast iron skillet over medium high heat. Add the oil and then the onion. Sauté the onion until it begins to caramelize, then add in the garlic. Season the mixture with salt and pepper and transfer to a bowl. Cut the chicken cutlets into small cubes and add to the bowl with the onion mixture. Pour in the Frank’s RedHot and stir to coat. Sprinkle half of the mixture back into the skillet and then top with half of the cheeses, and then repeat. Transfer the skillet into the oven and bake until the cheese is melted and bubbly, but not brown - about 15 minutes, but check often! Top the dip with additional Frank’s RedHot, sliced scallions, and cilantro. Serve immediately with tortilla chips and vegetables for dipping. Keep a spoon handy to help you get the dip out, as it’s a thick cheesy dip! Check the recipe notes if you’d like to serve these as tacos! 1. Make the recipe as written and just scoop the dip into warm tortillas. Top with sliced celery and additional Frank’s RedHot. 2. Make your dip without the chicken (same process just omit the chicken and hot sauce). 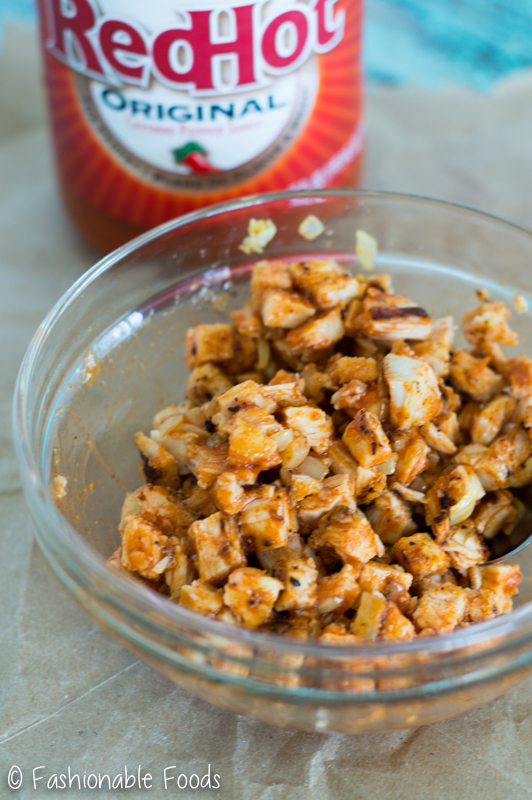 Grill your chicken the same way, but slice it and toss it with the ¼ cup of Frank’s RedHot. Serve by scooping the fundido into a warm tortilla and topping with sliced chicken and celery. *Corn tortillas are gluten-free, but if you don't require gluten-free, you can certainly use flour if you prefer! The key to a delicious queso fundido is using a good melting cheese. Don’t overcook or bake for too long, otherwise the cheese will release too much oil into your dip. Cook or bake just until cheese melts and serve right away. Oh my gosh, oh my gosh, OH MY GOOOOSHHHH! I freggin’ LOVE me some queso fundido, Keri!! Like, LOOOOOOOOOOVE IT! 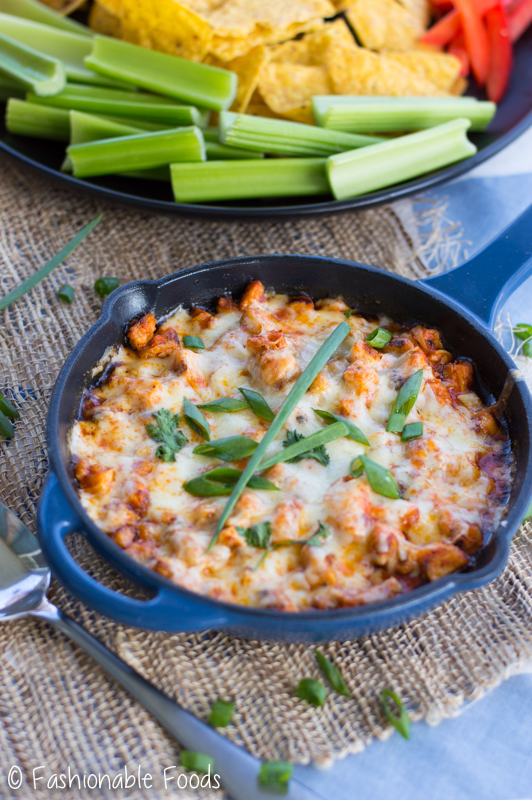 Naturally I am seriously swooning over this buffalo chicken fundido! This is just GENIUS! I mean buffalo flavored anything rocks my world, but buffalo + chicken IN fundido?! Stop it! I NEED this. Immediately. I’m thinking for dinner. 😉 Cheers, dear! So I’ve never had queso fundido before, and now i’m wondering WHY, as I love Mexican food! 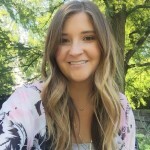 This is such a fun recipe, Keri! I’m loving the spicy flavor and I think my husband and I would devour this in no time. And I love your suggestion of serving it in appetizer or main dish form…YUM!! You say spicy I say yes, please! Add a little cheese into the mix and I’m one happy girl. I’ve never had Quesa Fundido before but it looks like my kind of snack. Wow, this is perfect for a summer BBQ Keri! Thank you for sharing.